The American Association of Endodontists estimates that about 24 million root canals are performed each year. This number is only expected to rise in the coming years. Even with growing numbers of patients who have undergone this procedure, root canal therapy is still largely misunderstood. This is the main reason that it has such a bad reputation of being dangerous and painful. To help dispel the rumors about this “scary” procedure, we’ll give you the root canal facts in this blog. We know this might be hard to believe. In fact, if there is one thing you’ve heard about root canal therapy, it’s that it is incredibly painful! The scary thing is that even some patients who have undergone the procedure will say that it is painful. The important thing to know is that the procedure itself is not painful, the infection inside the tooth is what causes the pain. The truth is, there is a lot of pain that is associated with root canal therapy. However, it is the infected tooth that causes the pain. During the procedure, the dentist will use anesthesia so that you will not feel pain. Then, the infected pulp and nerve is removed and the bacteria will be cleaned out. This process removes the painful infection. 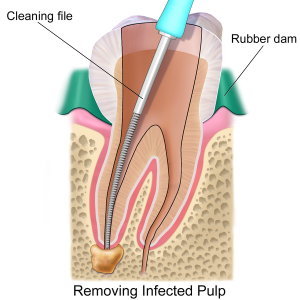 When you have an infected tooth the number one priority is to remove the decay before it spreads. It is ideal to save and restore the natural tooth during this process. That is what root canal therapy aims to do. Instead of pulling out the entire tooth, this procedure removes only the infected area and then restores the natural tooth. When you extract a tooth, there are many consequences. For example, you may experience jaw bone loss in the area where a tooth is missing. Root canal therapy is completed in two and sometimes just one visit. However, tooth extraction means waiting for weeks or even months for the prosthetic tooth. Root canal therapy is cheaper, quicker and more effective than extraction. Root canal therapy can be completed in just two visits to our office. In fact, many times this procedure can be completed in a single visit! Depending on your case, the dentist only needs to clean out the infection, fill in the tooth and place a crown. Usually the size and seriousness of the infection dictates whether the procedure will take one or two visits. We hope these root canal therapy facts help to dispel any negative preconceived notions you may have about the procedure! If you are suffering from an infected tooth visit us at Kim Norman, D.D.S. Dentistry for the Individual. We offer our expertise in root canal therapy to save and restore the natural tooth! To schedule your appointment, visit us at our office in Maryville, TN or call us today at (865) 982-9662 or schedule online.